[caption id="attachment_119" align="alignleft" width="300" caption="RC Buggy"] [/caption] RC buggies are fun as they have off-road features that enable you to race them on any terrain. In addition, you are able to customize your very own buggy from the different models and parts that are currently available. 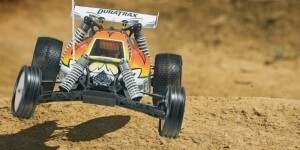 With the increasing popularity of radio control buggies amongst racing enthusiasts, you may want to know the best brands to select as a beginner. Kyosho, Associate Electronics and Schumacher are just some of the most popular radio control buggies brands available today. Based in Tokyo, Kyosho is a Japanese company which produces radio control buggies along with RC helicopters, planes, boats and on road cars. The company is recognized as the first of its kind to manufacture RC models in Japan, their first creation being the Dash 1. And once the radio control buggy fad had caught on, they launched their first radio control buggy model the Dune Buggy in 1972. With passing years, the company has developed a strong fan based of loyal remote control enthusiasts with whom their high end collectors' grade remote control toys have proved increasingly popular. Schumacher Racing Products was established in 1981 and it also manufactures radio control toys such as the popular buggies. Founded in Northampton, England, this company is renowned for producing the very first adjustable ball differential. As the top selling brand in radio control models in Europe, Schumacher has also been successful in producing its Competition All Terrain vehicle, which became the first champion at the International Racing Championship. Also known as Team Associated, Associated Electronics, also an RC toy developing company was founded by Roger Curtis and Lee Yurada. When deciding which of these brands to go for, you should remember that each comes with its own specific pros and cons. However, once you weigh the benefits against the negatives of each, you will be able to choose the right radio control buggy brand for all your RC hobby needs.